Porc meat is number one on the list in most European countries. Holland in particular is notorious for its 'bio-industry': massive stables were thousands of pigs are prepared for the meat market. In am not a vegetarian, and must admit that I find porc meat very tasty from time to time. But any animal, living in the wild, domesticated or used for human consumption, deserves a decent life. This also includes pigs that are known to be highly sensitive and socially intelligent animals. 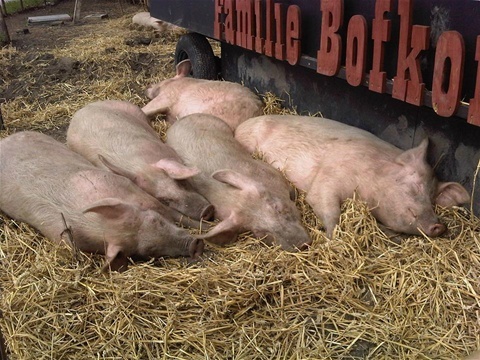 For a pig a decent life is quite simple: it means the possibility to move around on a piece of farm land or in a stable of sufficient size, roll about in some hay or a pool of mud, and taking care of the piglets. Unlike the industrial pig farms, were pigs have a horrible life from birth to death. Most pigs don’t even have enough space to turn around, or to care for their young. Their stress levels are high and many pigs start biting each others tails. Males have testicles removed after birth. Their living conditions are really a disgrace, but cheap porc meat is still sold and wanted in the supermarkets. But there exists another happy pig colony, not in the woods or in the city but out on a small Island in the Bahamas. Here a colony of wild pigs snooze in the shade on an idyllic island called Grand Major Cay (or ‘Pig island ’), a part of the Exuma string of Cays. The pigs are thought to have been left on the island by sailors who probably wanted to make a food reserve for the future. But they never returned. The wild pigs have nothing else to do but eat, sleep and swim. I believe that Jim Abernethy and Eric Cheng were the first Uw photographers who started taking pictures of the pigs in 2009. The pigs are good swimmers and love to paddle around their visitors in the crystal blue water of the beach. The smart pigs have worked out that the crews of passing yachts regularly dump excess food into the sea. Their drinking water comes from a springs on the island.